Many of the creative catalysts leading to EN: a raincity street dance have been almost accidental. In fact my very entrée to the project was quite the product of fate. I was rehearsing the TomoeArts’ production, Ten Nights of Dream, at Centre A, when Vancouver artist Glenn Lewis approached me and asked if I wanted to be part of a street performance event he was curating called The Procession of Performing Circles. I had never met Glenn, but the project sounded interesting so instantly I said “Yes.” I then continued focusing on my rehearsal, having no idea what I had signed on for. This was the beginning of the “fate” part of this voyage. 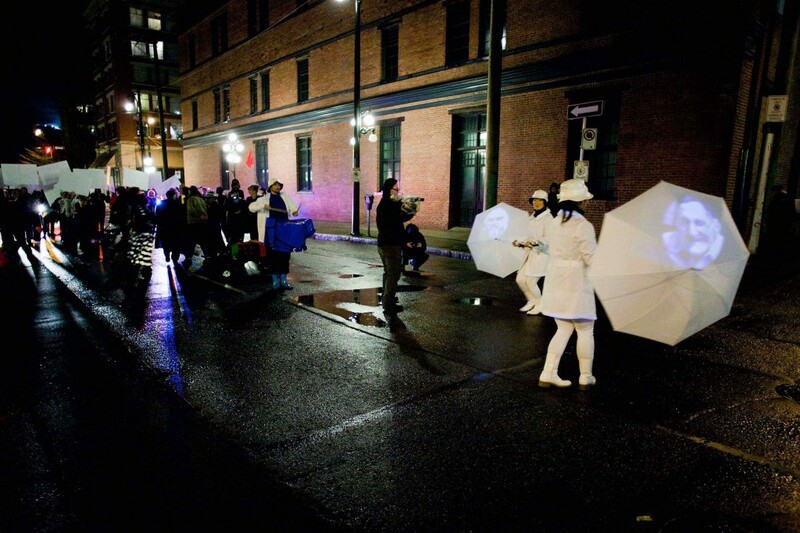 Less than a year later TomoeArts was one of six groups involved in the crazy street parade that was the Procession of Performing Circles—part of the Bright Light public art event during the Olympiad that literally “lit up” the Downtown Eastside. Each group in the procession was requested to create a performance using circles and light that was EXACTLY five minutes in length; we would perform when the procession stopped at each block on the evening parade route through Chinatown and Gastown. As always, my process began with research and meditation on the main themes or ideas of the piece; in this case…processions, circles, and light. TomoeArts does work rooted in Japanese traditional aesthetics and forms, so I looked at the many types of performance in Japan connected to outdoor processions. I looked at matsuri or festivals and how dance and music is used in the performative aspects of these festivals. I have over a decade of training in nihon buyoh (Japanese classical dance) and began playing with some of the connected movement patterns or gestures that might be part of these events. I decided to use taiko as the core of the music as it is a main festival instrument and enlisted percussionist Eien Ishikawa-Hunter to create the music and play live for the performance. The concept of circles was much more vast. I thought about the “circle” literally in terms of circular patterns in the movement, and then began to work with the tangible circular prop of an umbrella. A kasa or Japanese umbrella is a common prop in Japanese classical dance, and the practicality of the dancers using an umbrella for an outdoor performance scheduled early March in raincity Vancouver made it an obvious choice. I began thinking about the philosophical meaning of “circle” and the double meaning of “en” which led to an exploration of how the community of Vancouver has “danced” in the rain of this place for generations. 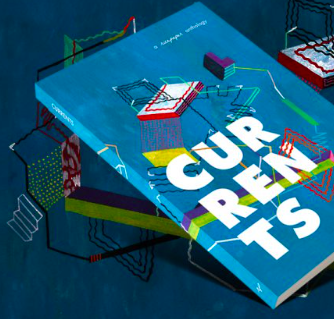 The work began to take dramatic shape in the study of community and human relationships. The need to use “light” in the performance was more elusive, but here again, “fate” stepped in. Glenn had purchased two hand-held projectors for another part of the project, but found he couldn’t use them. I immediately said that I would take them—having no idea how to integrate this technology but knowing they would lead to something interesting. In my earlier contemporary dance-theatre project Ten Nights of Dream I had worked intensively with large-scale projections, and now this opportunity to develop a way to use intimate small-scale projections fascinated me. Personal—intimate—human—community—generation…I wanted the projections to be images of real people. But the projection surface? It had to be the umbrellas. We mounted the projectors onto the umbrella handles—and suddenly I had twice the number of people performing in the piece. It is at this point TomoeArts’ partnership with Hope in Shadows began; Hope in Shadows’ community photography contest produces many beautiful and poignant images of the Downtown Eastside (DTES) neighbourhood, and I arranged to use a few of their photos for the procession performance, making the layers of meaning complete. Our relationship with Hope in Shadows has since become the heart of this creative process and has led to further development of the piece into EN: a raincity street dance, a 30 to 40-minute performance we are doing for The Dancing on the Edge Festival this year. In EN: a raincity street dance, we are expanding all the major themes and movements of the original piece, strengthening the relationships between the characters and enhancing the use of projections. We have commissioned five photographers who are all DTES community members, and all past winners of the Hope in Shadows photography contest, to take portraits and landscapes of the neighbourhood for use in the show. These images will become characters in the performance—not just the portraits on the umbrellas—but also the landscapes and the images of the neighbourhood, which will be projected onto the wall and fence of the Firehall Arts Centre courtyard. We’ve kept the performance outdoors, though it’s no longer a procession. In the creation process so far, we have been working on the integration of movement and music. Eien Hunter-Ishikawa is writing the music, and like the choreography, we are striving to develop the right balance between the traditional and the contemporary. Eien and I both have years of training in Japanese traditional performance as well as contemporary Western art (Eien in music; myself in theatre and dance) so we both experience this tension in all our work. We are trying to maintain some core aesthetic principles like ma (a concept of space and time meaning silence/emptiness/stillness or “potential” movement and sound) and jo-ha-kyû (slow-breaking-fast) kind of rhythmic structure, while freeing ourselves to create outside those boundaries. Eien is incorporating non-Japanese instruments which gives him an enormous range of possibilities. Eien and Alcvin Ryûzen Ramos will play all the music live—allowing for contingency within the performance—with the musicians and dancers following each other at different points in the performance. Rain images are influencing the rhythms and textures of the work, and we are using words like “downpour” and “small drops” as metaphors for the feeling of a particular phrase. The diverse backgrounds of the performers are also affecting the music and choreography. Any traditional Japanese art takes years to learn, and those trained in the forms often do not ever experiment outside the form. I don’t have the time in a few weeks of rehearsal to fully train anyone in nihon buyoh, so it necessitates that I instill what I can, then use the training the dancers already have. It is critical for me to work with performers who have an understanding of character and story as nihon buyoh is an inherently theatrical form. One more element of “fate” has influenced this project. 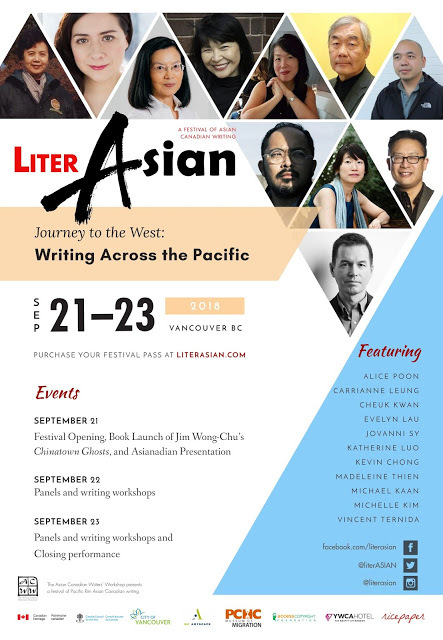 In my research I discovered a poem by Vancouver’s Poet Laureate Brad Cran called “Today After Rain.” The poem embodies all the themes I have been working with from EN’s first inception. I then discovered that Brad has been working with Hope in Shadows for years, and in fact had edited their award winning book of community oral history. Finding this poem felt like all the shifts and developments have led us to exactly the right place: more focus on the rain and local Vancouver community and less on the Japanese content; more on human relationship and less on form. At a recent Hope in Shadows event, three of the photographers I worked with were there and their candour and excitement for being part of this project was palpable. The one line from “Today After Rain” seems to encapsulate this project’s entire process: “Somewhere this is a collection worth polishing,” he says. Yes, we have collected all the ideas, the memories, the visions, the skills…all the bits and the pieces that have come to us by fate as much as by design…and we polish. EN: a raincity street dance was recently performed during The Dancing on the Edge Festival, in the courtyard of the Firehall Arts Centre, Vancouver.